Hey gang, Valkor here. Last week the folks at Square Enix paid a visit to the NYC area, bringing along a few choice titles to help kick off New York Comic Con (NYCC). And while games such as Thief, Dues Ex (Wii-U), Final Fantasy X/X-2, and Kingdom Hearts 1.5 Remix were on tap, I chose to stay close for some extensive hands on with Lightning Returns: Final Fantasy XIII. You have seven days to save the world but you can stave off the world's destruction up to 13 days by either completing missions in the main quest or freezing time using Chronostasis. The world she inhabits is a very open world full of life. At one point, while traversing an open field, a couple of soldiers on chocobos attacking a monster and if you choose to, you can assist. 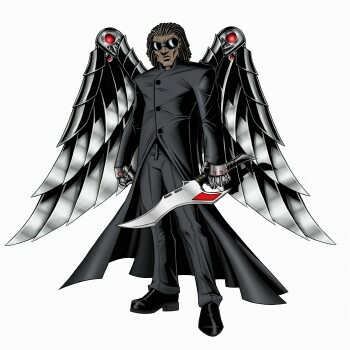 When we dove into gameplay, we were placed at Canopus farms where we had to meet with Dr. Gysahl to begin a mission about finding a special white chocobos called the Angel of Valhalla. 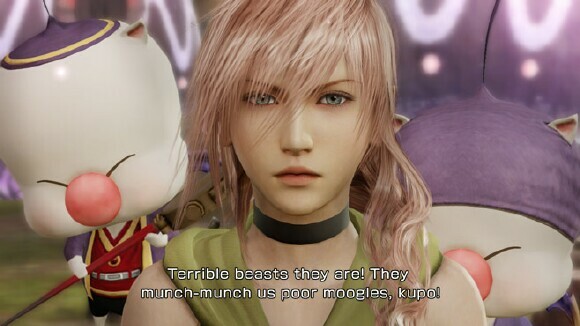 But they're hard to catch so in order to capture you, you need to fight a creature called the "Chocobo Eater". Once you've collected the mission an indicator arrow will point you in the direction you'll need to travel. When you hit the open field, monsters will appear around you rather than tossing you into random battles. And depending on whether you or the monsters strike first, you can either weaken them or they can weaken you. When I faced the Chocobo Eater, I tagged him with a quick hit (using R1) depleting him of 25% of his HP. Wicked! When I first jumped into battle with Lightning Returns, I assumed the game was hack and slash action RPG. In fact it is not and it plays much like Crisis Core in an advanced Active Time Battle system (ATB). 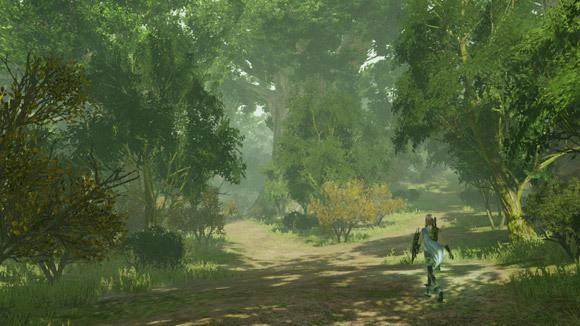 While you have complete control of Lightning in the battle arena, you cannot button mash the enemy to defeat. Rather it's more like you're giving her commands in a turn based battle. 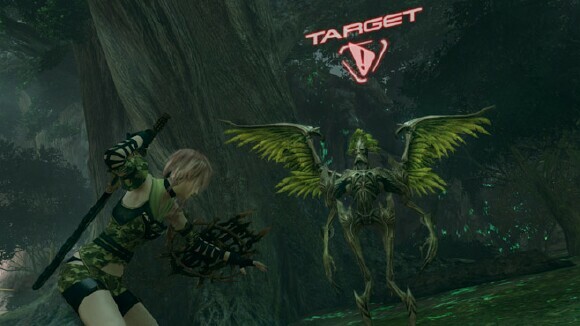 Costume changes play a huge role in Lightning Returns and it's something similar to Paradigm Shifts in the first FFXIII game. 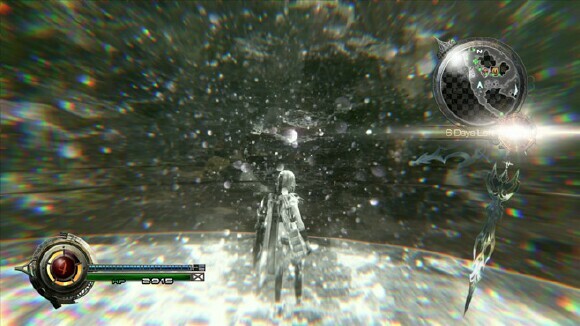 Each costume offers Lightning different abilities, which then depletes her ATB gauge. You can switch costumes on the fly so when the ATB gauge of costume depletes, she can switch to a new costume with a full gauge. And of course the gauges fill as you progress through battle. The enemies you face on the battle field have their strengths and weaknesses. So you have to be mindful of what suit you choose in battle; while there are attacks that can either slowly or quickly deplete an enemy's HP, there are some abilities that can strengthen or they can absorb. My initial impression: I went into this event not so much wanting to learn more about the story surrounding this title, but mainly wanting to know more about the battle system and how the different costumes fit in. I was a tiny bit disappointed that this "action RPG" wasn't as actiony as I would have like, but that's not a big deal. While I totally dig the advanced Active Time Battle system, I would have liked to have more options of attack that didn't deplete your ATB gauge. 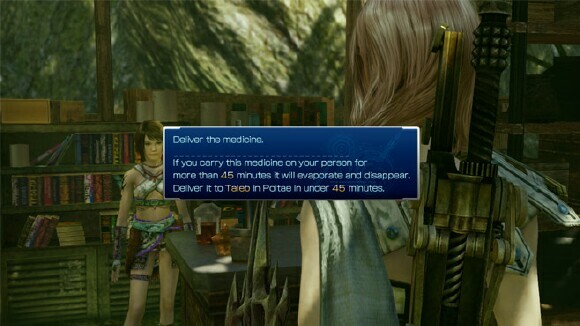 I mean in many an RPG you can at least attack freely; hell even in FFXIII and Crisis Core you can use attack with the loss of anything, so why not in this title? The costume changes are a nice addition to the title and I'm curious to see how they play out overall. I was disappointed they didn't have Cloud's Soldier uniform on hand, I'm hoping at a future event I can get some hands on with the costume. Finally the battle sequences seem to go on a bit longer than they should. I mean if I'm fighting a Slime creature, it shouldn't have taken as long as it did to defeat it/them. 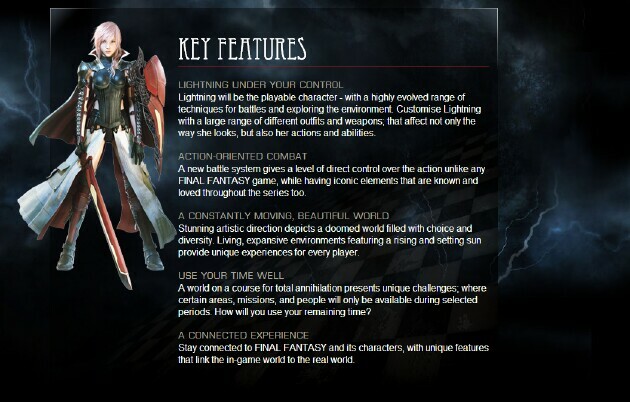 Lightning Returns: Final Fantasy XIII gets a release next year and while I've only gotten the chance to learn about Lightning in the first FFXIII game, I'm more intrigued about her adventures in this title. The game is beautiful woven together with what appear to be a very rich and dialogue heavy story. You can peep these pics and vids to hold you over until the game's release – at least it'll hold me over until then.